These stuffed sweet potatoes make the perfect weeknight meal. Healthy and satisfying, this meal an be prepped ahead to save you time throughout the week. Making four (very) stuffed sweet potatoes, this recipe makes enough for lunch or dinner all week long. Plus, with an oven already preheated, it’s easy to prep other food for the week such as extra chicken breasts, roasted veggies, homemade granola and more. Cheers to a healthy and delicious week! 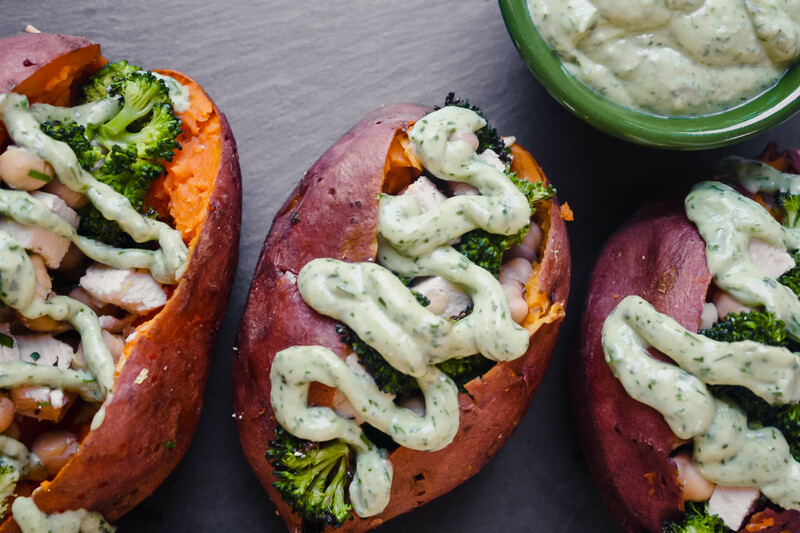 These stuffed sweet potatoes, made with tender chicken breast, broccoli and chickpeas get drizzled with an avocado green goddess dressing to create the perfect weeknight meal. Preheat oven to 375°F with rack set in middle position. 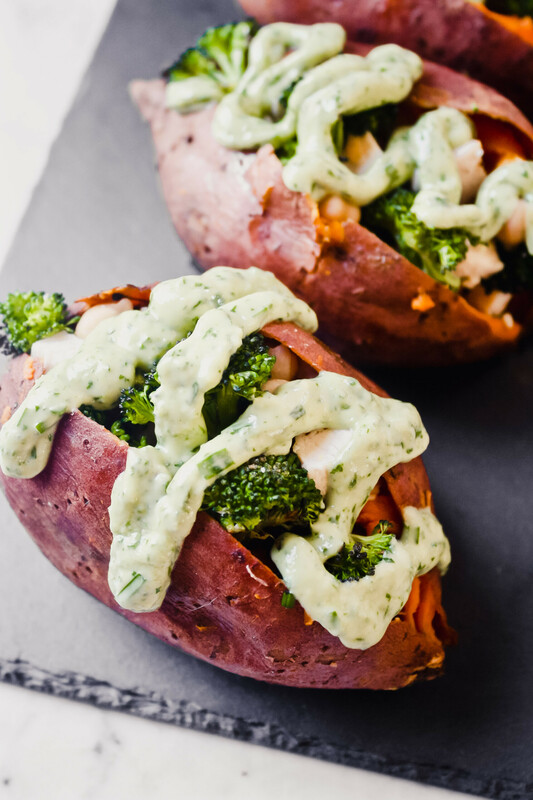 Pierce each sweet potato several times with a fork then wrap each individually with foil. Set potatoes directly on racks and bake until fork tender, 45 to 60 minutes. Meanwhile, line a baking sheet with parchment paper and coat with cooking spray. Pat chicken breasts dry and transfer to baking dish. Brush with olive oil; season with salt and pepper. When finished baking, remove sweet potatoes from oven and increase temperature to 400°F. Bake chicken until it reaches 165°F, 25–30 minutes. Remove chicken from oven, tent with foil and rest for 5 minutes. Turn oven to broil and line a baking sheet with foil. Arrange broccoli florets in a single layer and evenly coat with cooking spray; season with salt and pepper. Broil broccoli until lightly charred and crisp-tender, 8–10 minutes. Cut chicken into bite–sized pieces and combine with broccoli florets, chickpeas, chives, and lemon zest in a large bowl. Cut a slit length–wise down each sweet potato, making sure not to cut through the bottom or sides, creating a pocket. Gently press ends of sweet potatoes to open the “pocket”. Fluff the flesh of the sweet potatoes, removing some flesh to make room for the filling (reserve for a other use). 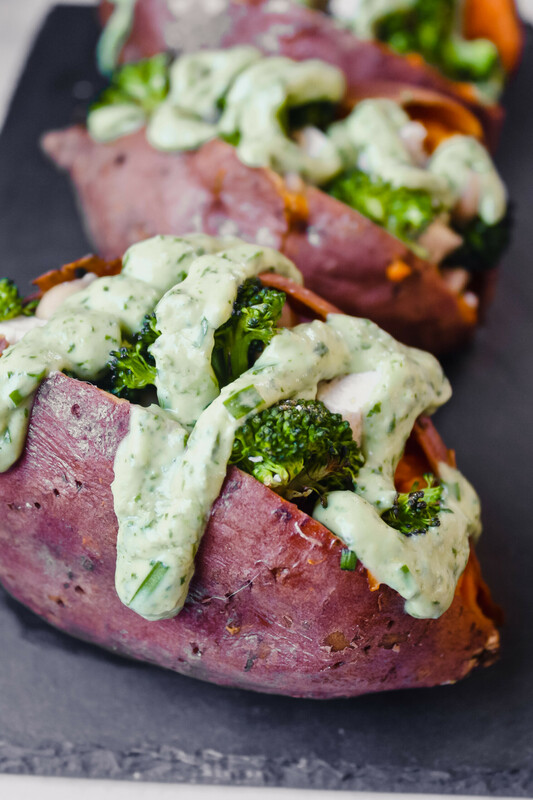 Spoon chicken filling into each sweet potato and drizzle with Avocado Green Goddess Dressing.